I couldn't pick just one word to describe this year! 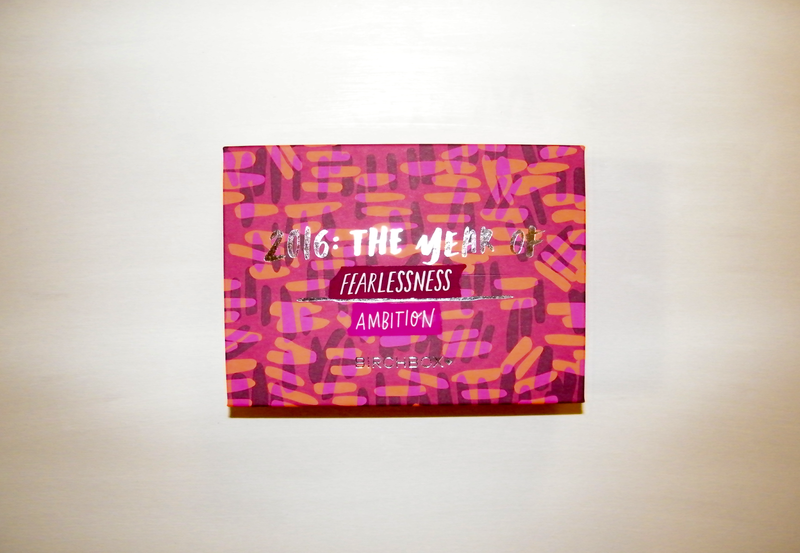 First Birchbox of 2016! Yay!! I seriously love getting my Birchbox every month. It's like getting a little Christmas or birthday present. But now onto the good stuff! 1. Cartier La Panthere ($76-$108) // This is perfume that's described as having notes of gardenia and musk. I'm not a fan. At all. Way too musky for me. It actually reminds me of a men's cologne. No thank you. 2. TONYMOLY Delight Tony Tint - Red ($6) // This is lightweight lip stain. I'm actually a big fan of stains because they don't budge all day. There were little chunks when I put it on and I couldn't tell if it was from the brush applicator or I had something on my lips. As for the "no budging" it didn't last all day. I had to reapply it around lunch. And it didn't wear off evenly. It's definitely not bad if you only need to wear it for a few hours! As for all day wear, I'm not sure I would buy a full size. Especially because it dries your lips out so you need chapstick on hand anyway. 3. Cynthia Rowley Beauty Eyeliner in Black ($16) // I put this stuff on and it went on super smooth. I was pretty impressed! I have an issue with eyeliners going on without much hassle. Even though it says it's smudgeproof, it definitely ran a little on the outer corner of my eyes throughout the day. Nothing I've never dealt with before (thanks to oily skin almost any eye makeup will run on me). 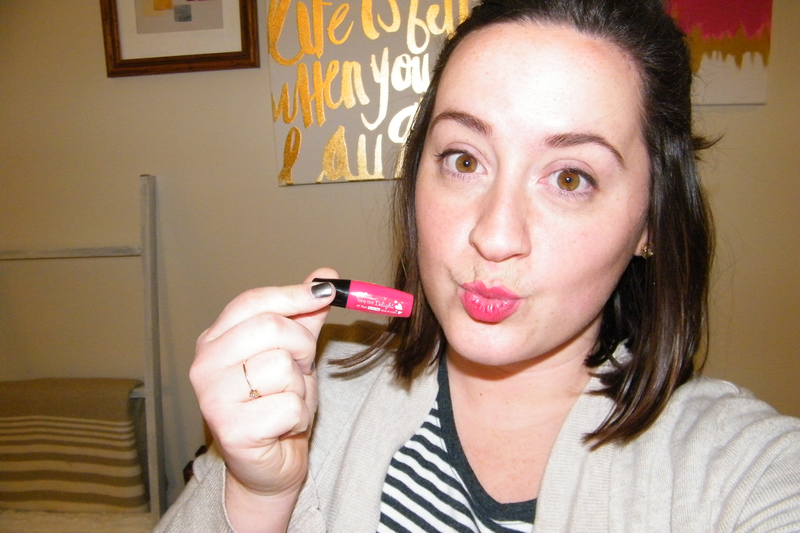 It also lasted through a workout with very little smearing so I was impressed! 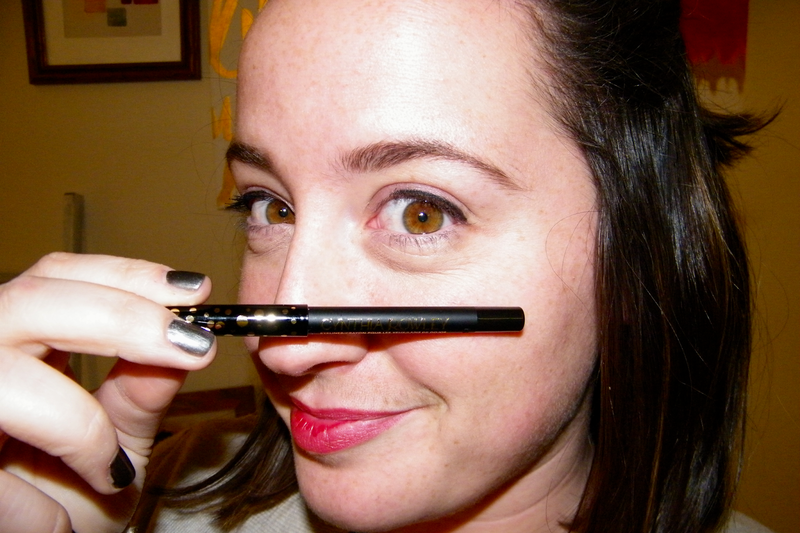 I'm not sure I'd spend $16 on a full size eyeliner, but I would love to find a quality dupe! 4. Ciate London Mini Paint Pot - Mistress ($15) // Nail polish! One of my favorite things! 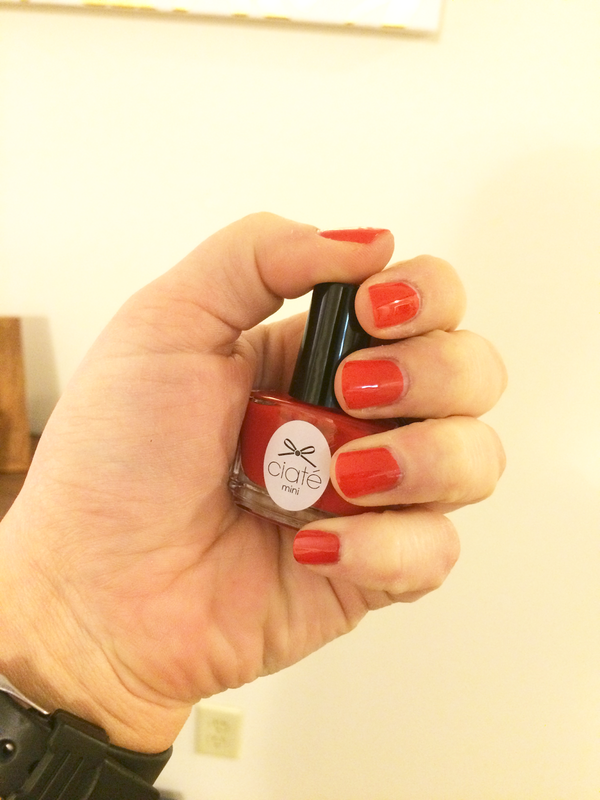 This color is bright red, a color I can't get enough of no matter what time of year. It's a standard red, a lot like the color that was already on my toes. So far I haven't had any chips so fingers crossed it stays that way for a few days! 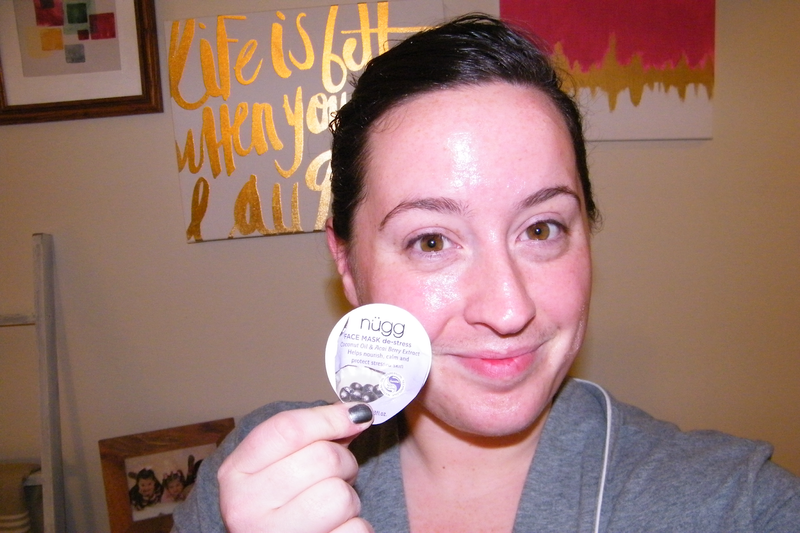 5. nugg Beauty De-Stress Mask ($16.50) // Target sells the sample size of this stuff and I love them! I've bought a couple other types of face masks and absolutely loved them! Even the samples you could get two masks out of which is great. 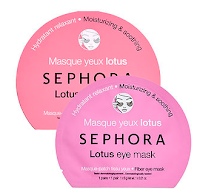 As much as I love the sheet masks, I do love this stuff and would likely buy a full size one! Overall, this was a pretty good box. Other than the perfume (seriously I couldn't wash it off quick enough), I'll definitely use the samples as well as possibly buying a couple full-sized items. The older I get the more I take care of my skin. I've always taken pretty good care of it by washing it twice a day and always taking my makeup off before going to bed. But recently I've really stepped up my game. I have really oily skin and huge pores. It's awful. I've always been self-conscious about my pores because I always feel like my skin doesn't look as pretty as it should. I've never really struggled with acne except one or two before Mother Nature comes to visit so my skin is really clear. But having large pores just makes it look not as good. 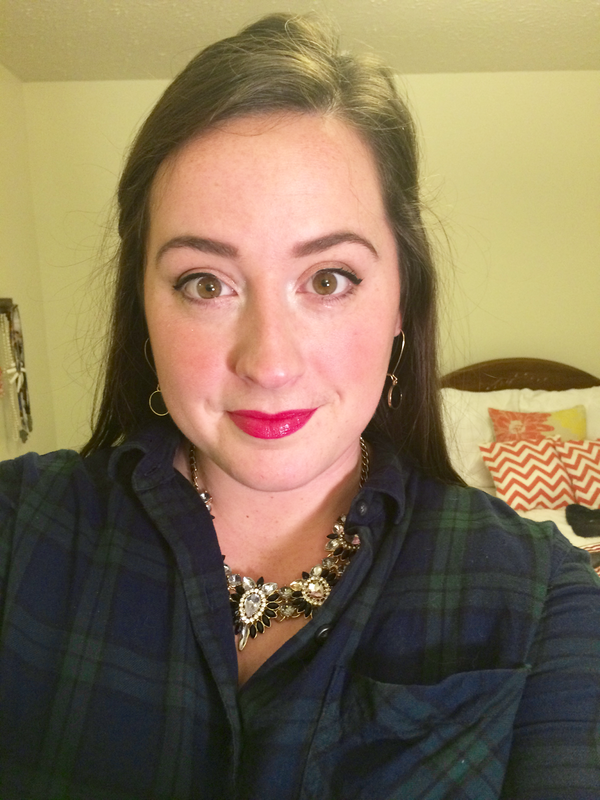 So I've recently fallen into a routine that has helped diminish the size of my pores. I know I can't really shrink them - it's thanks to genetics and oily skin that I have them. But I can decrease their appearance and work to "hide" them. This skin care routine takes time. It's not a super quick routine, but the longer I keep it up, the more I notice a difference. 1. Cleanse. I use Mary Kay TimeWise 3-in-1 Cleanser for combination/oily skin twice a day (morning and night) to wash my face. I was always an avid user of Garnier or Clean & Clear face washes, but Mary Kay has made a huge difference in my skin. Every now and then I miss the feel of a true face scrub so I'll add a little sugar to it to get the same feel. 2. Makeup Removal. I love Almay's makeup remover pads. I've been using them for years and I don't plan on using anything else anytime soon. Even if I think I got all my makeup off when I washed my face, I still use a pad just to make sure! 3. Tone. I use Proactiv's Revitalizing Toner twice a day. I've had this since my brother used Proactiv but never used the toner. It's lasted me a long time, but I'm almost out of it so I'm on the hunt for a new brand. (If you have any suggestions I'd love to hear them!!) Using toner has made a huge difference at how long it takes for my skin to start looking oily. It took a while for my skin to adjust, but I feel like it takes longer to see the shiny spots on my face. 4. Moisturize. 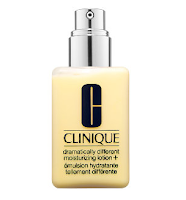 I use Clinique Dramatically Different Moisturizing Lotion+ twice a day. In the morning I add SPF by using sunscreen for face. I forget the brand because I've had it for so long and the label came off a while ago. I usually combine my moisturizer and SPF before putting it on my face so save a step. 5. Eye Cream. I already have wrinkles. Just crows feet and laugh lines (I laugh and smile a LOT so I knew this would happen). I haven't shelled out a ton of money on wrinkle cream, but I have started using eye cream to try and fight the dark circles and bags under my eyes (also genetic but whatever). I'm currently using Garnier Ultra-Life Anti-Wrinkle Firming Eye Cream. I'm still undecided on it, but I'm giving it time before I decided if it's worth it or not. 1. Hydrate! Probably something you've heard before, but my skin is the first place I notice dehydration. I try to drink 2 liters (8.46 cups so it's more than the recommended 8 cups a day) of water a day (it rarely happens but it's a good goal for me). If I don't drink at least 1 liter (half of the recommendation!) I notice it in my skin. The more water I drink, the brighter my skin looks, the less noticeable my pores are, and the less oily my skin gets. On top of all the other health benefits of water, my skin is the most outwardly noticeable so I try my hardest to stay hydrated! 2. Hands Off. Right now I'm doing a ton of reading. Not fun reading. Science reading. It can get really dull and really boring and if I'm not careful, I'll end up propping my head up on my hand. Do you know how gross my hands are? I always wash them after using the bathroom and whenever I use chemicals (even with gloves on), but they're still gross. They have oil and bacteria all over them. It's no wonder I breakout after a couple days of touching my face for extended periods of time! It's a conscious effort to not touch my face, but the less I touch it, the less I breakout. 3. Primer. 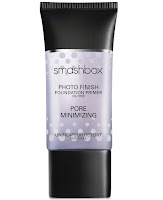 I'm a big fan of Smashbox Oil Free Primer. Even if I'm not wearing foundation, it still smooths my skin out and diminishes the look of my pores. 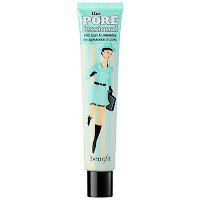 I've tried other brands (Maybelline Baby Skin Primer and Benefit POREfessional Primer) that work well, but Smashbox is my favorite. It's definitely the most expensive I've ever tried, but it doesn't clog my pores and it works the best for me so I splurge. 4. Face Masks. 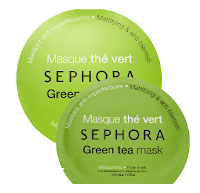 The Sephora Collection Face Masks are my favorite. They're the masks that are a sheet with the good stuff on them so you look a little scary while wearing it, but they're amazing. They're Eye Masks are wonderful too! These are masks I could use once a week and be totally content! I notice a difference in my skin after only one use, so continued use must be better, right? 5. Diet. Yet another once you've probably heard. The better my diet is, the better my skin looks. It totally makes a difference! I think of it this way: the more grease (oil) I put in, the more oil comes out. The greasier the food, the oilier my skin gets, and the more I breakout. 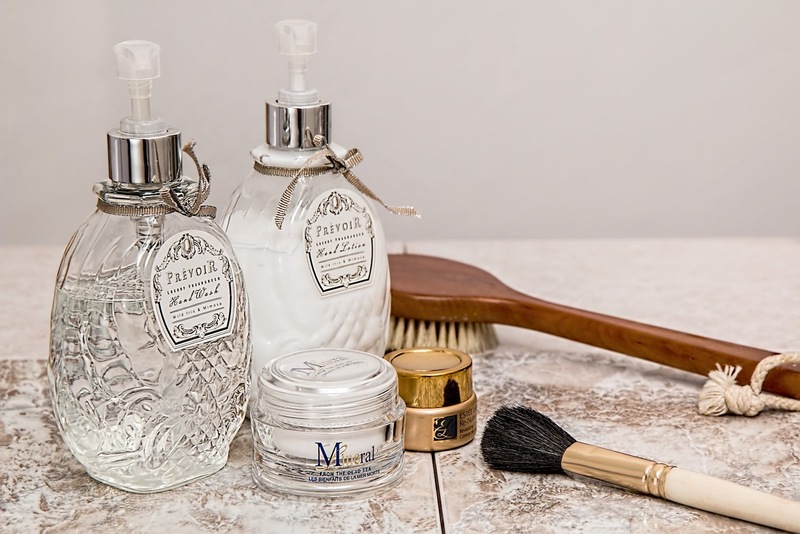 This is one of the easiest and cheapest ways to get clear skin (water consumption is probably the cheapest!). And there you have it! I'm all about long-term consciousness, so by taking care of my skin now, I hope to have great looking skin for longer. What are your skin care must haves? I get questions all the time about what grad school is like. 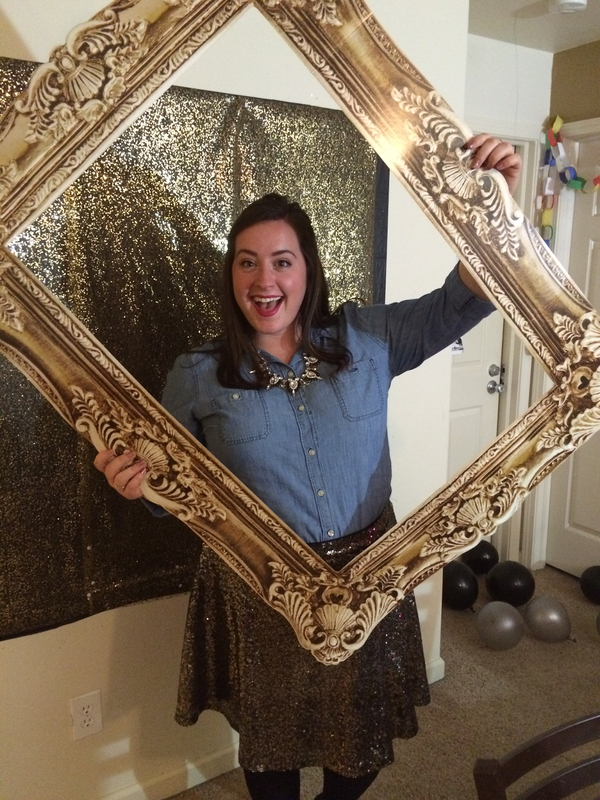 So this post is for those of you who are thinking about grad school or just curious. Keep in mind not everyone's grad school experience is like mine. I'm getting my degree in chemistry so my schedule would look a lot different from someone who is getting their degree in say English. 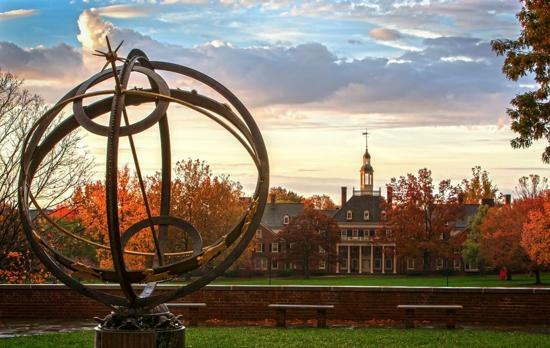 I'm also studying at Miami University. This is probably my favorite picture of our campus. It's absolutely beautiful! I usually get to work by 8. Partly because I like how productive I am in the morning and partly because all the good parking spots are gone by 8:05. 1. Research. I have two projects (hopefully finishing one and starting another soon!) so trying to balance them is a challenge most of the time. 2. Classes. Even in grad school, you have homework. 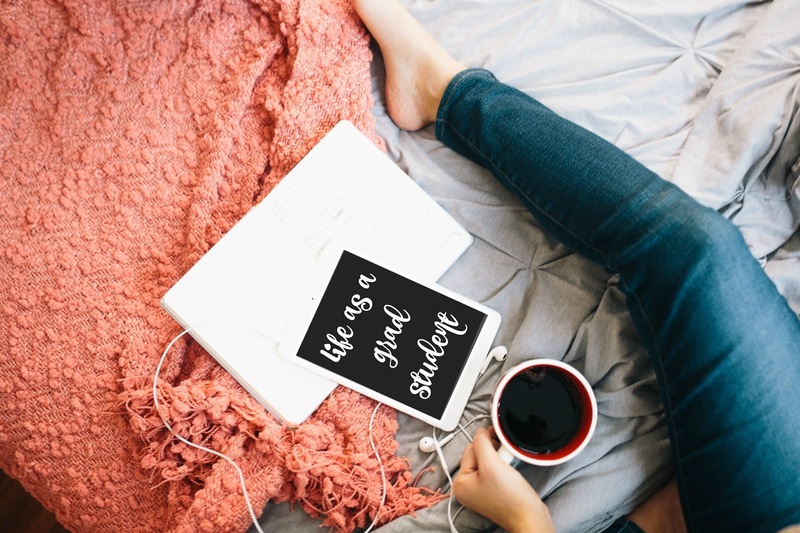 And if you aren't taking classes or you don't have homework for a class, you're likely studying for an upcoming qualifying exam or prepping for a presentation. Everyone is required to take two seminars: a department and a divisional seminar. 3. Instrument care: Part of my job description is to run and care for a couple instruments in our department. I run samples for people and have to make sure the instruments are clean and running like they should. 4. Teaching. This takes up a lot of time! There's so many responsibilities rolled into this one aspect: teaching labs, grading lab reports, holding office hours, answering e-mails from students, and attending meetings. Not everyone teaches the entire time they're in grad school, but pretty much everyone will teach a lab their first year. I spend my morning working on my never-ending to-do list. I'm either analyzing data from the previous day (or week), working on something for a class or seminar, or trying to figure out where my research is going next (aka reading lots of articles). Every morning looks different, but there's always something that I could be doing (even if I end up on Pinterest a few times). I like to be intentional about my lunch. Because a grad student's work never ends, it's easy to work through lunch or quickly eat at my desk while working. I like to take at least 10 minutes to sit in the hallway or with friends and eat. If I'm eating with friends it can easily turn into an hour-long lunch! This is a good time to take a much-needed brain break so I can recharge and power through the afternoon. Also when it's warm, I love to eat outside so I can enjoy sunshine during the day. My afternoons look a lot like my mornings. I'm still working on my to-do list. By now I've likely added more things to it though. My list will usually double or triple in length if I've talked to my boss. I never leave work at the same time two days in a row. Some days I don't have as much going on so I leave around 5 (or earlier let's be honest I've left work at 4 before) while other days I can be in the lab until 8 (or 11 on those really rough days). I've started going to the gym right after work so I'm trying to make it a point to leave around 5. There are going to be days where that doesn't happen, but it's nice to give myself a harder deadline to work toward. So there you go! That's pretty much what I do in grad school. 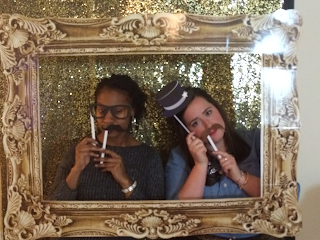 It's a lot of (very hard and often frustrating) work, but I also have a lot of fun. 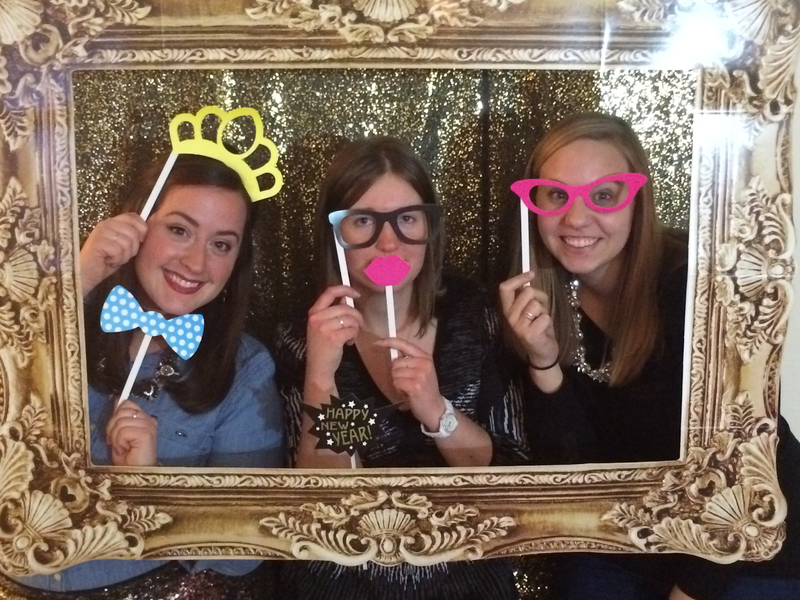 From traveling to new places to canoeing down a lazy river and everything in between, grad school has been a blast. Hey y'all! Today I thought I'd share a nail polish review. I have a slight (okay, major) obsession with nail polish and I'm always looking for new brands or new kinds or new colors. 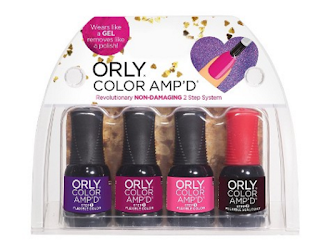 For Christmas my mom got me this little sampler of ORLY Color Amp'd polish. 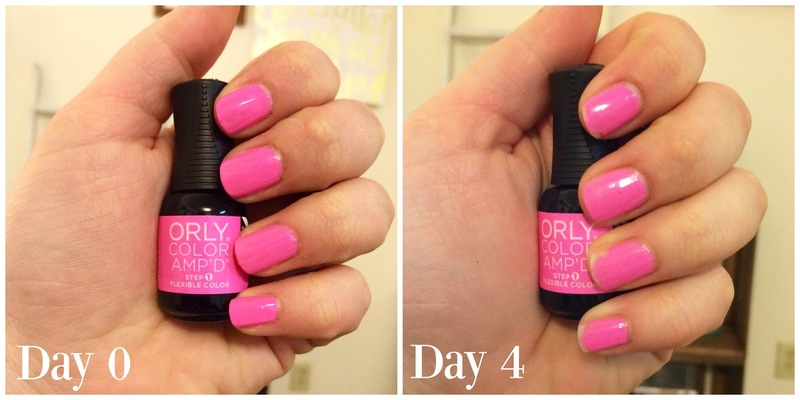 I like ORLY polish to being with, so I was excited to try this! 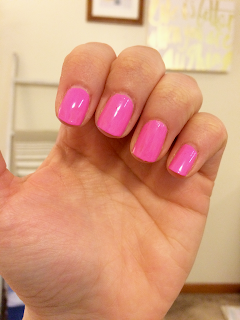 If you haven't noticed, gel polish is a huge hit! I'm a fan of gel polish and if I could, I would keep gel polish on my nails at all times. Unfortunately it's a little too expensive for me which is why I love the gel hybrid polishes that drugstore brands have been coming out with. A large handful of these hybrid polishes come with a UV light, but not ORLY Color Amp'd. Their tag line is "Wears like a gel, removes like a polish." And no lamp needed! It's also promoted as a flexible color, meaning surface flaws will disappear. I'm totally down with that. Here are my thoughts I have on this new gel hybrid polish. Some bad, some good. I almost did a pros and cons list, but I like numbered lists better! 1. It dries super quickly!! You put two coats of the color on followed by one coat of the clear coat. No basecoat needed! But the best part was how quickly I could do my nails. As soon as I had painted all of them, they were dry and I could move on to the second coat. I will say that I should have let the second coat dry for a little longer before adding the clear coat because it smeared the color a little and made it look thinner in parts on my nail. Oh well. But I was able to open a bottle of wine about 5 minutes after painting them and there were no smudges, scratches, or chips! 2. The color of the bottle is not what's inside. This was a little disappointing. I started with the maroon color in the middle, but it came out more mauve. The purple on the left was a very bright purple while the pink was definitely a neon pink. I even browsed the colors (and picked a couple more up) at Target to see if this was a theme among all colors and it definitely was. It's not a bad thing but if you're going to buy this polish, make sure you open the bottle to double check that you like the color! I will say the glitter polishes are the truest to color. 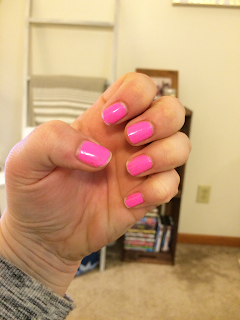 This color, LA Selfie, matched pretty well according to this picture, but in real life, the bottle label looks less neon pink, which is what the polish goes on as. I mean, it's bright pink! 3. It wears like a polish. When I say wear, I mean it chips. I was expecting that if it "Wears like a gel..." that it wouldn't chip as quickly (gel manicures can last two weeks!). Granted I work in a chemistry lab where I'm exposed to organic solvents that are notorious for stripping nail polish (if you follow me on Snapchat [aerichardson] you saw what happened to my pinky nail), but I'm usually pretty careful when handling them to I avoid ruining my polish. Unfortunately, this stuff chipped quickly. 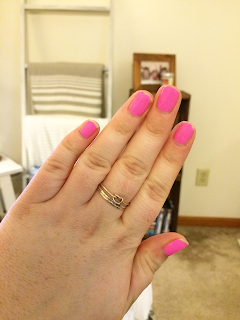 I painted my nails Saturday night, and these pictures are from this morning (only 4 days later). 4. But it comes off like a polish...seriously! I was really surprised at how easy it was to take this polish off. It was easier than when I do base coat + two coats of color + top coat! I was also worried it would stain my nails because you don't use a base coat. I tried a red polish, a color notorious for staining nails, and my nails were as clean as if I had used a basecoat! Overall I'm really on the fence about this polish. I love that it doesn't need a basecoat and that it dries quickly (definite pro for all my busy ladies! ), but it chipped just as quick as my regular polish. It's also a little more expensive than the polish I normally buy. I'll probably use what I have, but I doubt I buy more colors. If you do want to buy it and try it for yourself, it's at Target! Have you tried this polish or do you have another gel-hybrid polish you recommend? Let me know!! 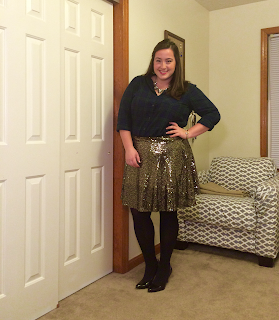 So I know New Year's Eve already happened, but I thought I would show y'all how I incorporated sequins into my outfit. 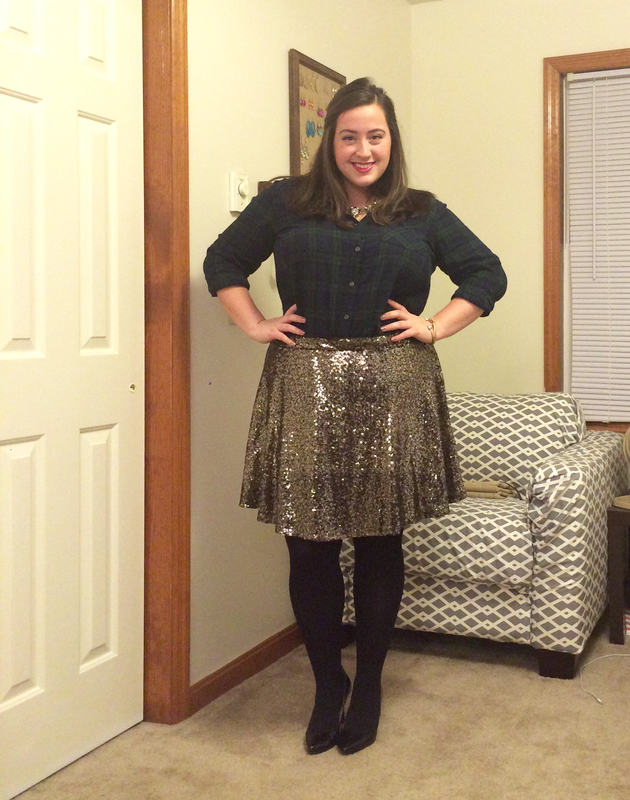 To start, I paired my sequin skirt with a flannel shirt, tights, and heels. 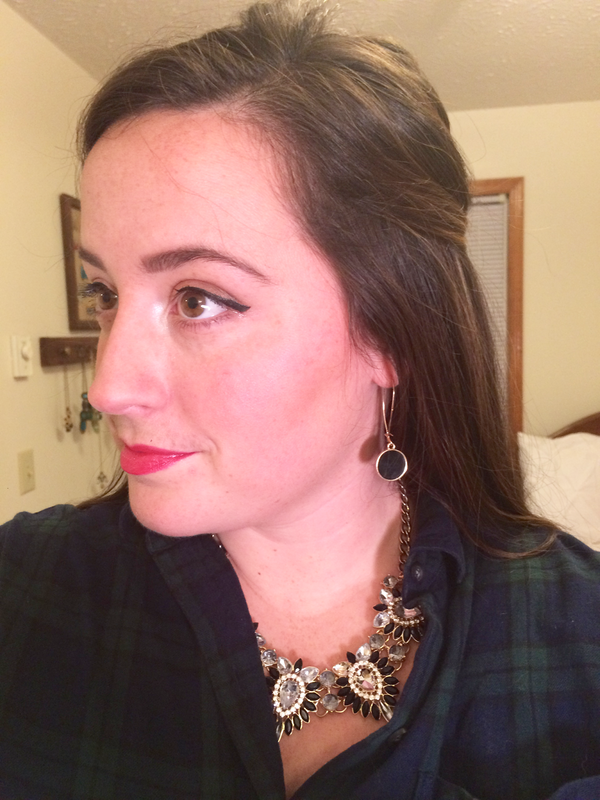 For my makeup, I chose to use liquid eyeliner with a slight flick on the outside and pair it with a bold red lip (y'all know I love my bold lips!). I wore a fun, sparkly necklace in neutral colors and black and gold simple earrings. Unfortunately as I was making buffalo chicken dip, I spilled some food on my flannel so I had to change. So embarrassing I know. Thankfully, a chambray shirt looked just as good with this skirt! I changed my shoes to my grey wedges (they're also way more comfortable than my heels). 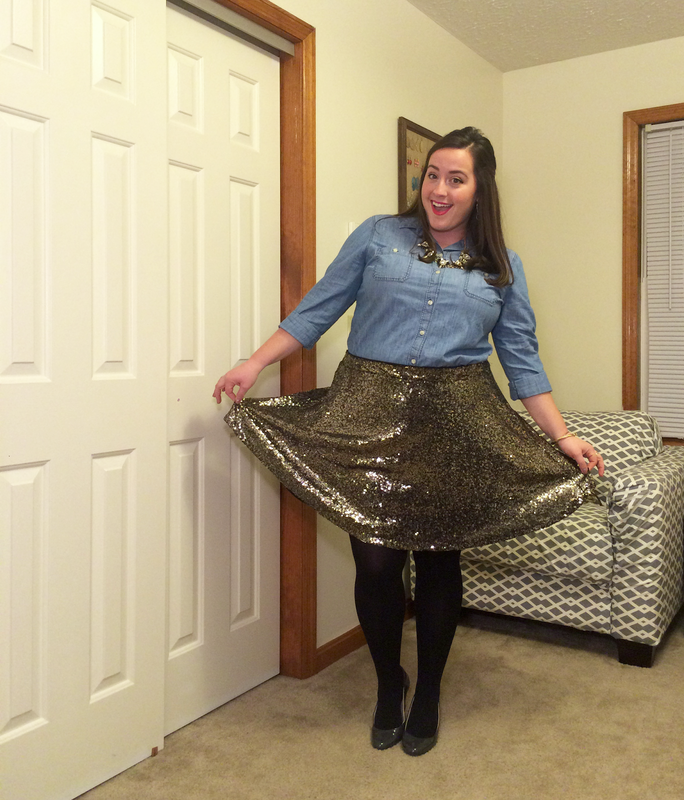 I'm obsessed with this skirt! If I could wear it at least once a week I totally would. 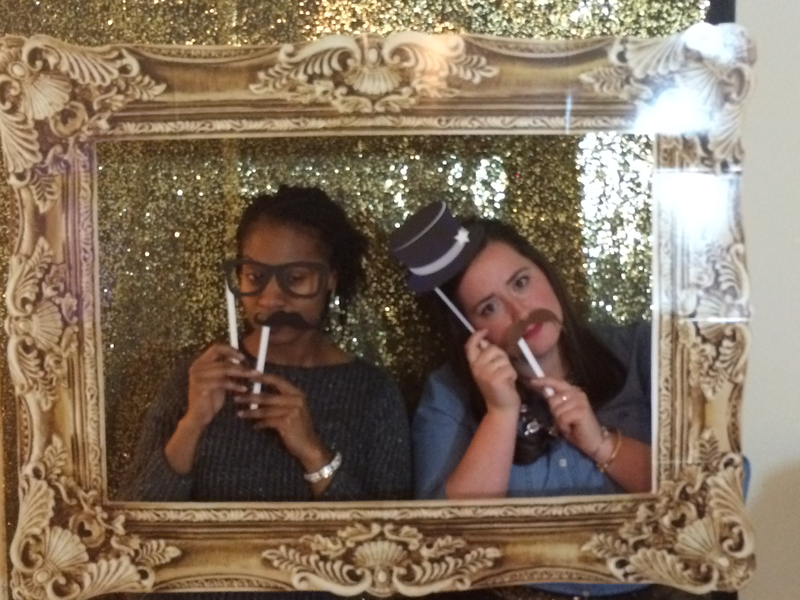 My friend Alex and I having fun with mustaches. 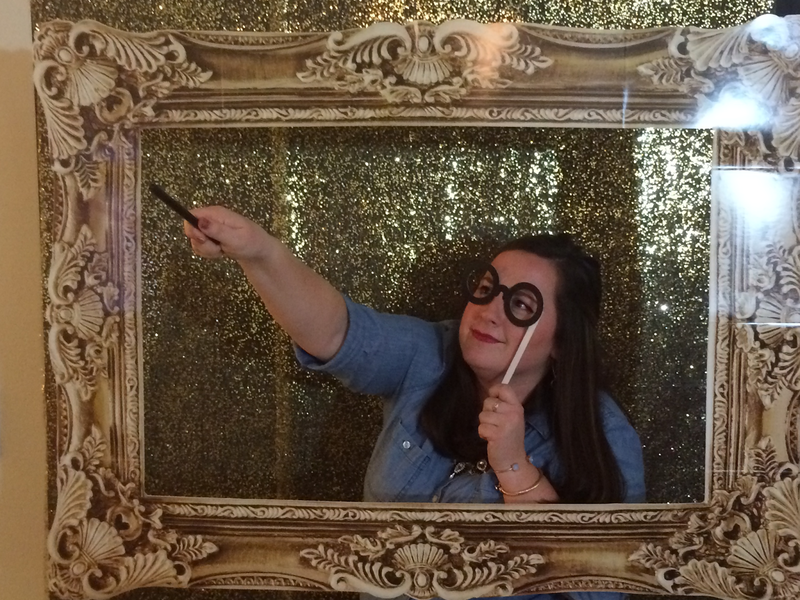 Because I will always be a Harry Potter kid. My friends Katie and Kate. The frame eventually fell down, so I improvised! I hope y'all had a wonderful New Year's Eve! Here's to keeping resolutions (if you made any) and making 2016 the best year yet! Happy New Year y'all!! I hope you had a wonderful night ringing in the new year last night! Whether you spent the night in your comfiest clothes or your sparkliest dress, I hope it was wonderful. Yesterday I posted about my favorite memories from 2015. Today, I'm making my goal/wish list for 2016. Here we go! 1. Travel to (at least) one new state. My top place to visit is Colorado. Then Maine. Then Washington. Basically I'm all over the place. I would also LOVE to spend time in Canada! 2. Stay serious about a healthy lifestyle. I did really well with the Fit Girl's Guide 28-Day Jumpstart and I plan to do it again starting Monday. I was recently diagnosed with insomnia (something I'm positive I've struggled with my entire life). If a healthy lifestyle can bring Aunt Flow around on the reg, maybe it'll help with my sleep. 3. Stick to my budget. I love spreadsheets. So much that I made a killer budget sheet...too bad I never stick to it! I plan to take an entire month and seriously stick to my budget in hopes that I can stick to it every month after that. My emergency fund is basically non-existent but it really needs to built back up. 4. Figure out my quiet time. No joke this is a goal of mine every single year. I've always felt like if I don't do my quiet time first thing in the morning that I'm a bad Christian. After a talk with my Bible study, I realized that was such a silly statement to make! God loves me regardless of when I spend time with Him. 5. Spend time growing my blog. 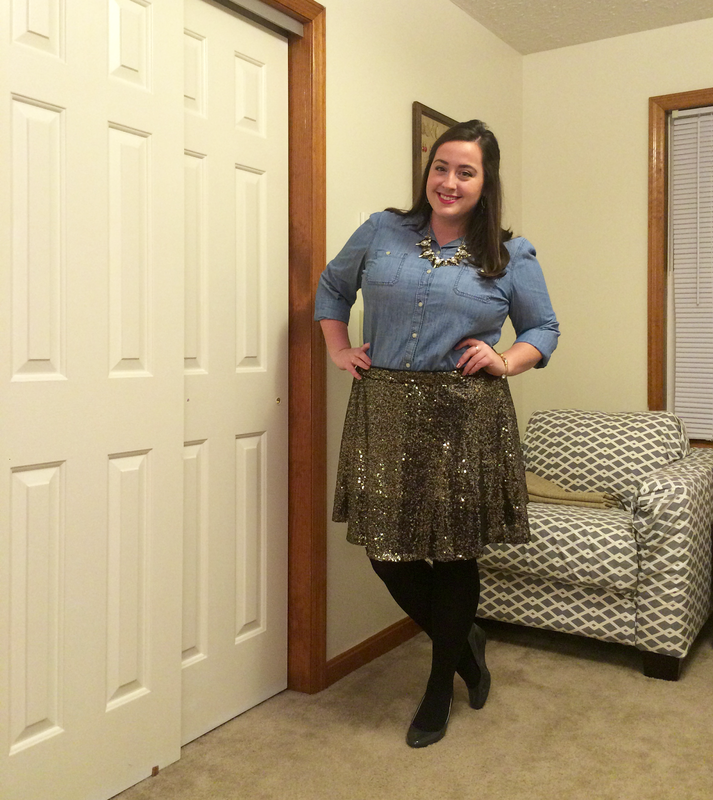 Blogging has been such a great outlet! 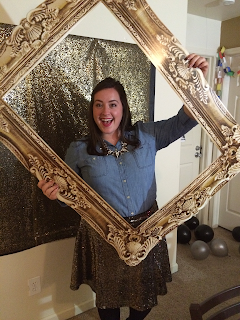 I love learning new things about blogging and getting to know new women through it. I would love to grow it into a more integrated part of my life. Lately it's been more of an afterthought but I want it to become a bigger part of my life. 6. Say no more often. I'm a people pleaser to the core. I hate making people feel bad or uncomfortable. I would rather make myself uncomfortable or upset than someone else, and that's gotten me in a lot of trouble with my conscience. Here's to saying no to people, places, and things I know I don't want to be at or around. 7. Say yes more often. Yes to adventure and spontaneity. Yes to time with friends and family. Yes to time by myself. Yes to surrendering my life to the Lord...all of it (easier said than done but it's a goal!). 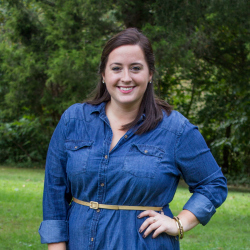 What are your biggest goals for 2016? Anything you're excited to do (or not do)?